The April issue of Card Player Europe is now available online and features an Irish special with a look at Europe’s longest running no-limit hold’em tournament, the Irish Open. Before finding its new champ, Kevin Vandersmissen, who is featured in an upcoming digital edition, this cover story takes a look at the tournament’s history, and how the year was for the defending PaddyPowerPoker.com Sole Survivor and overall champion Niall Smyth. The issue also gets to grips with Ireland’s pride Eoghan O’Dea who finished sixth in the 2011 World Series of Poker main event for more than $1.7 million. Other features include The Poker Ten — Overused Poker Terms And Expressions and Bart Hanson’s Crushing Live Poker With Twitter, not to forget blogs and a ton of analysis featuring Tom Schneider, Sorel Mizzi, Steve O’Dwyer, and Antonio Esfandiari. Why not test a digital subscription right now by viewing one of the free articles from this issue. In April’s edition check out a key hand for Anton Wigg on the way to taking down the European Poker Tour Copenhagen and an indepth interview with Joe Hachem regarding everything from his main event win to his new role as ambassador for the Asian Poker Tour. The magazine, as well as an archive of more than 500 issues, is available to be viewed in rich media flash versions or mobile-friendly HTML formats. All you need to view each issue is a digital subscription. All current print magazine subscribers get free digital magazine access by logging into their Card Player account and verifying their subscription. Those who don’t have a Card Player account can create one today to sign up for your digital subscription. Not a Card Player magazine print subscriber? Get six issues delivered to your door for only $9.95 PLUS instant access to the digital archives by signing up for a print subscription now. 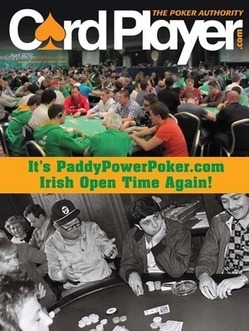 Tags: Poker News, Card Player Europe, April Issue, Poker News, Poker Business, Poker Strategy, Live Poker, Online Poker, Irish Open, World Series Of Poker, Main Event, Niall Smyth, Eoghan O'Dea, Joe Hachem, Anton Wigg.